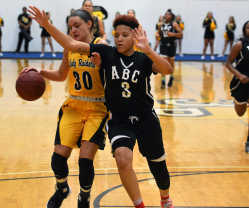 The Lady Raiders defeated Arkansas Baptist for the second time this season. This time, though, it was for their 10th straight win as Three Rivers continues to roll. J'Kayla Fowler led the way with 18 points as the Lady Raiders defeated Arkansas Baptist 86-48 Tuesday at the Bess Activity Center. Leading by nine points at the half, the Lady Raiders annihilated the visitors in the second 20 minutes, outscoring them 44-15 in the final two quarters for another blowout win, including a 25-7 edge in the final frame. "We had a pretty good discussion at halftime on how many points they'd scored and we told them they were better than that. In the second half, we just flat out guarded them," Three Rivers coach Jeff Walk said. Kim Shaw (10), Hailee Erickson (11) and Jordan Little (12) also scored in double figures for the Lady Raiders in a balanced effort. Three Rivers also had a season-high 68 rebounds and 26 offensive rebounds while the Lady Buffaloes had just seven offensive rebounds. An'Nyah Pettus led the Lady Raiders with 14 rebounds while Hannah Thurmon and Deanay Watson each had 10. It is the first time this season that three Lady Raiders had double-digit rebounds in the same game. "Those three kids who ended up with 10 rebounds or more, that is an impressive night out of those three," Walk said. The Lady Raiders got out to a quick start with a 6-0 spurt courtesy of free throws from Thurmon and Watson. Shaw helped out with a couple of mid-range baskets. Arkansas Baptist was using its size to find mismatches in the paint and earn some baskets in the post to trim the lead. "The shots weren't going in early and we started feeling sorry for ourselves and not playing defense," Walk said. "We were getting point-blank looks the first half, the ball just wasn't going in." Three Rivers' Casey Douglas (30) dribbles as Arkansas Baptist's Kortni Collins defends during the first half of Tuesday's game at Three Rivers. Fowler got going as soon as she checked in, drawing a foul and making a pair of free throws. She then scored after Katelyn South threw the ball up the court for a finish at the basket. Fowler kept beating Arkansas Baptist's defense down the court in the first quarter, leaking out for a couple of baskets in transition to help the Lady Raiders led by as many as 12 points in the opening frame. Fowler finished the first half with 13 points on 5 of 6 shooting from the floor. Little got going toward the end of the period with back-to-back 3s on the wing to build the lead to a dozen. An 8-2 run in the second quarter helped the Lady Buffaloes trim the lead to as little as five points in the second, but the Lady Raiders weathered the storm and led by nine points at the half as Casey Douglas buried a baseline jumper with under a minute on the clock. "We just didn't shoot the ball very well and we were still thinking about that missed shot while we were trying to play defense. Once we stopped doing that and started guarding them the offense started to take care of itself," Walk said. The Lady Raiders kept up the pressure and outscored the Lady Buffaloes 19-8 in the third quarter to take control of the game, leading 61-41 at the start of the fourth quarter. Three Rivers was 14 for 44 (31.8 percent) shooting in the first half and 16 for 39 (41 percent) in the second half and didn't allow a 3-pointer in the second half. In the final 20 minutes of play, the Lady Buffaloes were 7 for 30 (23.3 percent) from the floor. Next up for the Lady Raiders, they'll host Moberly Area at 5 p.m. Saturday. Three Rivers defeated Moberly Area by 22 points on the road in their first matchup on Jan. 13.